First Line: "I never knew Tyasha ke Demit, but her execution started everything." Review: Raisa is a slave she is also a tutor since the last one was executed for treason due to helping with the resistance that is brewing amongst the slaves. Raisa likes being a tutor especially since it will help her finally read her heart verse something her father gave to her before he was killed and her people were enslaved, she didn't expect to fall for the kind-hearted Prince Mati or be asked by her people to risk her life to help with the rebellion as well. Raisa was a frustrating character most of the time. At first I really felt for her what she has endured and what her people have been through but at times I found her to be selfish especially when she was approached to help the other slaves and she flat out refused, at that moment I wasn't the biggest fan of her, I mean you see what your people are going through and you are in a position to help them but instead all you can do is think about yourself. I also wasn't a fan of some of her stupid decisions that put her and Mati in danger. So much could have been avoided. Luckily she does redeem herself for the most part. Prince Mati, on the other hand, was very likable. At times, he seemed too perfect but still loved his character. He had a lot on his plate and if fleshed out would have made for a more interesting and complex character than Raisa, I would have seriously loved some chapters from his point of view. I'm not going to give spoilers but let's just say crap happens and he has a lot more on his shoulders than what he wanted to deal with. The romance between Raisa and Mati was sweet but like I said previously he was just too perfect especially when it came to dealing with Raisa and the things this girl did that literally put him in jeopardy. 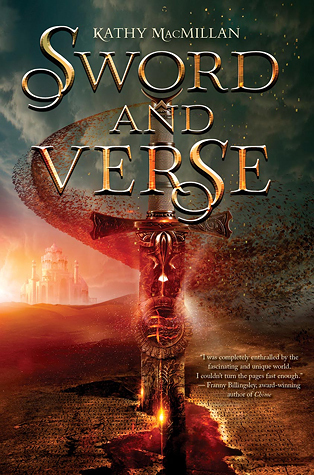 Even though it may seem like I have quite a few issues with the characters mainly Raisa, Sword and Verse was a fairly quick read it did slow down a bit here and there but I mostly flew through the book. The overall plot was interesting I was very curious to see how the rebellion would pan out and then there was the story of the gods which also kept my attention. I was worried for a bit that this might have a love triangle, but rest assured there was none and I love the fact that this was a standalone. ~"It means you're mine, and I'm yours, Raisa. It means I love you."